Several weeks ago a good friend of mine told me about this place called Chicken Oil Company in Bryan-College Station. He swore up and down they had the best burger. Ever. Having heard that statement from nearly everybody that tells me about their favorite burger joint - I pretty much ignored it. Well... after having a Chicken Oil Burger today - it is definitely one of the best burgers I have had - but not THE best. Chicken Oil Company not only has a good burger - but it has a one of a kind atmosphere that will make this burger joint stick out in this burger connoisseur's mind for many days to come. When a burger joint has the word "Oil" in the name of the place - you know their burger has to have some good oooze going on. Well the burger didn't disappoint. It didn't have the oooze of a Mel's Cheeseburger but it had enough oooze to keep the burger moist. I didn't have any oooze running down my arm or anything - but I did have to use a few napkins to clean up after eating this burger. The patty was very tasty. Not a whole lot of oooze... just right. The Snuffer's Special is a 1/2 pound patty. Chicken Oil Company also has a 1/4 pound burger as well as another 1/2 pound burger that has 2 1/4 pound patties. The Snuffer is a 1/2 pounder single patty. The patty on the burger was not a frozen patty by any means. You could see that it was clearly 100% beef and it looked very fresh. They will cook the burger medium if you don't ask for anything special which I think is just about right. If you cooked this more - it would be too dry. Medium is just about right. Overall the patty was very tasty. One thing that Chicken Oil Company does on the Snuffer is they add 2 pieces of cheese!! One on top of the patty and one on the bottom of the patty. Man oh man whoever came up with that idea should be given a raise cause that was AWESOME!! I love cheese and this burger had it going on and then some. The size of the patty was pretty good - not too thick to where the meat doesn't get cooked very well but not too thin to where you miss the flavor. All in all it was just right. Pretty good herd killer rating for the Snuffer. The Snuffer Cheeseburger was a 2 handed burger. It was big but it wasn't so big that you'd have to ask your friend sitting next to you to help you out or anything. But - it is a 2 hander - that is for sure. The Snuffer Cheeseburger Special is what I ordered. It comes with a 1/2 pound burger, fries, and a drink. All of that was about 7 and half bucks. Not too bad considering after I finished it I was pretty dang full. It isn't the value of a Christian's Totem burger where you pay 2 or 3 bucks for a burger that makes you full the rest of the day - but it is still has good bling bling. Chicken Oil Company had the typical menu. They had chicken fried steak, chicken fried chicken, buffalo chicken burgers and a grilled chicken salad that is supposed to be one of the best around. Nobody in my group tried any other things on the menu but the burgers and fries. The fries are the plain variety. Nothing really special. They weren't bad - they just didn't stand out in my mind as being great. We were going to get the Onion Rings - but they were a little pricey for my taste (4 bucks) so we passed. If you’re looking for something lighter, try our famous grilled chicken salad – it may be lighter but won’t leave you hungry! Every Monday after 4 pm, Chicken Oil company offers burgers at half price so if you are in the area and looking for a good burger at a very good price - I'd stop by Chicken Oil Company. The atmosphere at Chicken Oil Company has to be probably the most memorable part of the visit. It is a wooden building that looks sortof like a shack. (see pictures) Inside the walls are decorated with every type of animal imaginable. Definitely not the place that PETA should hold their next convention. There are also tons of posters and just random stuff decorating the walls. Kindof creates a pretty laid back "Texasy" atmosphere if that is a word. They also have a fireplace that when we were there didn't seem to be working very well. They had started up a fire but I think they left the plume closed because the place was filling up with smoke. They allow you to carve stuff into the tables. They are covered with stuff that people have carved into them. I like seeing stuff like that - it adds to the uniqueness of the restaurant. The wait staff was very friendly. I actually put them to the test - although not intentionally. I originally ordered the 1/4 burger - I have no earthly idea why. I went back and changed my order and the waitress I ordered with did not make a fuss about it - she changed the order and took care of it without making me feel like a schmuck for doing so. Big Kudos. Chicken Oil Company is probably 2 or 3 miles down College Avenue from the campus of Texas A&M. Overall Chicken Oil Company left a good impression on me. 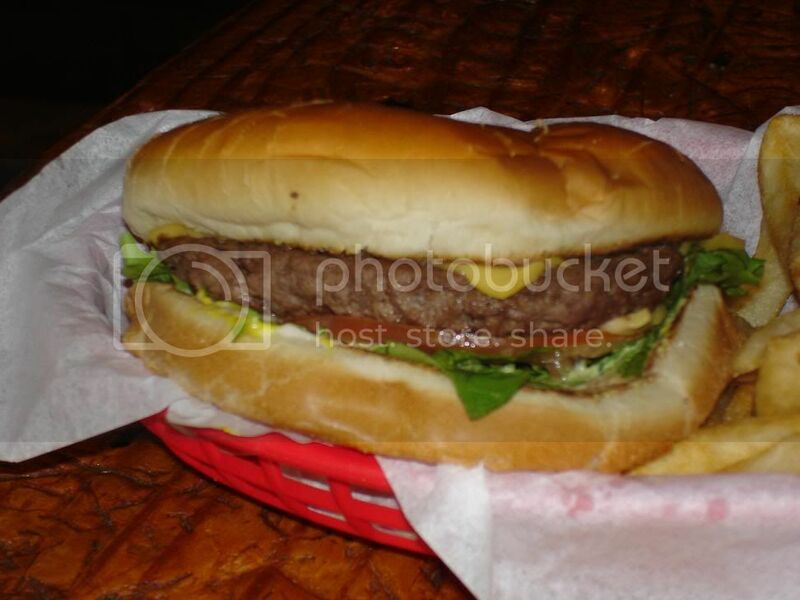 The Snuffer's special is a great tasting burger. The atmosphere at Chicken Oil Company is really something to behold. I had asked on the Aggie message board for recommendations for burger joints in the College Station/Bryan area. All of them said Chicken Oil Company was a must try. My friends that went to A&M backed up their recommendation. I am glad I took their advice and went. 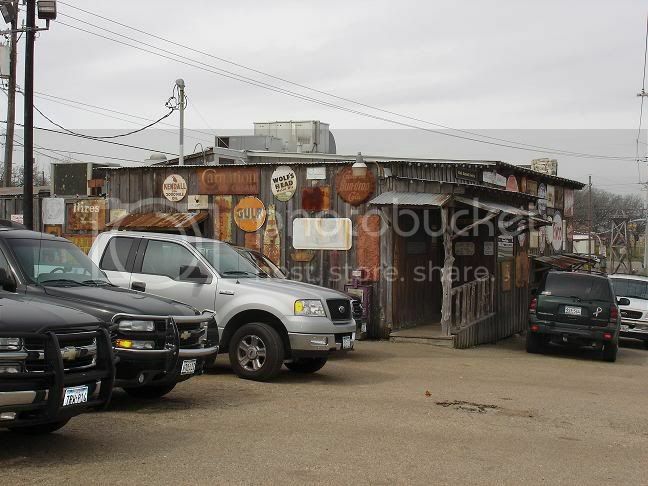 Chicken Oil Company is a great place to go visit - you are guaranteed the Texas atmosphere and a good tasting Texas sized burger. I've lived here nearly all my life and have as of yet to visit Ckicken Oil. After your review, I believe I'll give it a whirl! Wow I really like the idea behind your blog! Don't forget to check out Bobbie Joe's in Helotes next time you're around there. Thanks Sixlegged... where exactly is Helotes? Dr. F: Never tried Dixie Chicken - might have to try it out next time I am in B/CS. Used to be outside of San Antonio...until urban sprawl engulfed it like an ameba. Another good place- a biker bar outside Ft. McKavitt (sp). I can't remember the name of it but their ooze factor is off the scale! The "Cow Hop", formerly of College Station, used to have the "Cow Pie", not the Dixie Chicken. The Cow Hop in the late 70's early 80"s was awesome but someone bought and tried to clean it up, thus it died. 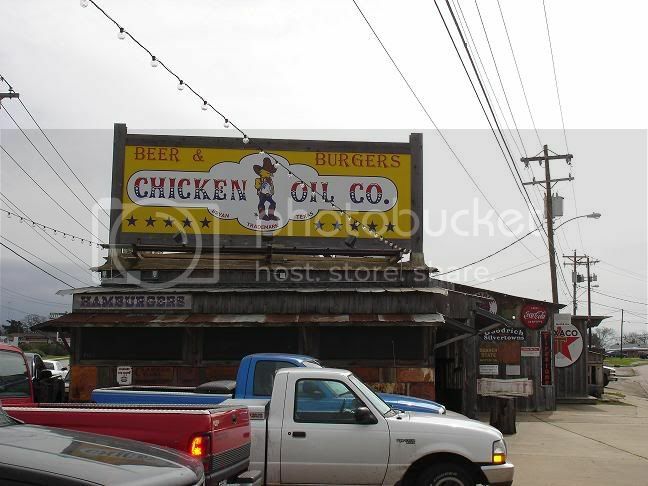 I have actually been to Chicken Oil & I actually once upon a time lived in Bryan! Got a kick outta seeing your review! Thanks! This is a cool site! I miss the old Cow Hop, for the price the burgers were pretty good. The burgers at Chicken Oil and the Dixie Chicken used to be identical. I think they are owned by the same folks. Kudos to Augustus for reminding me of the Cow Hop. The Deluxe Burger Bar in College Station (just down from the Dixie Chicken) has burgers that are good . . . not great, but their cheese fries are great with Ranch Dressing (artery clogging) and the bean burger (Refried Beans, Picante and crushed Fritos) is a neat alternative to your run of the mill burger. Give it a whirl! The Chicken Oil Company burgers are....OK. Not near as good as Tookies in Seabrook. You probably hit COC on a good day and Tookies on a bad day. If you want a GREAT burger and are in Pearland, Try Big Humphreys Italian Restaraunt. Yeah, an Italian place. Best burgers in town, and probably one of the Best in Houston. They make their own patties there. Mmmmm. I'm hungry for one right now! Great site. I'll definitely be back. The chicken oil is one of the better burgers in BCS, but I have yet to have a good burger in all of Texas. Everyplace is dissappointing. The best I've had in the U.S. is the Chuckbox in Tempe, AZ. A charcoal grill (something missing from most joints in TX) and fresh, large patties. Worth the trip. Need to chime in on two accounts. Man, I missed the Cow Hop. I worked there and it was a great time. I remember going there for the first time and being amazed at the amount of food (and quality) you got for $2!!! Yeah, it was 1980, but still. Al Scazerro, the owner was a great guy. The subsequent owners just didn't get it for some reason. The one that moved over to the site that was Claimjumper/Bonanza/Thai Taste/Perot for President, was the worst. No soul at all. As for B-CS burgers: The Burger House on College, Harvey Washbangers on Texas, Joe's Place in Wixon Valley, Koppe Bridge (both locations) and the place in Benchley (if it is still there) are all much better than Chicken Oil. Best burger in CS is Koppe Bridge, no doubt. The Dixie Chicken's burger didn't impress or disappoint, it was a good burger, but not enough to leave much of an impression. I'd always heard good things about Harvey Washbangers, but the night I went I got a dry little piece of crap. Maybe I went on a bad night, but I never had the desire to go back again. Just thinking about Koppe Brige though makes me want to drive to College Station. 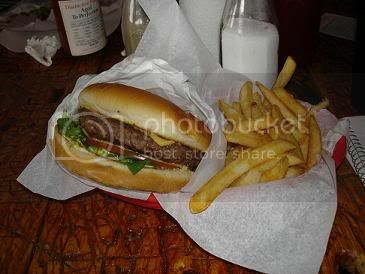 Their fries are kind of tasteless, especially after they cool, but the burger is big, juicy, and well seasoned. The "Texas Toothpicks," fried onion and jalapeno sticks, are quite tasty as well. To really test Chicken Oil you need to order the double-patty cheeseburger, not the snuffie's which has one bigger patty. There is just something about that extra patty... And, I always add "death" to spice it up -- now that's a good burger. With all the B/CS burger expertise here, can anyone tell me what happened to DSP (Dead, Solid, Perfect)? Used to be my favorite burger as a student, but that was over 20 years ago. Koppe is a big and I admit its not dry, but its tasteless. Its like a big versus of McDonalds. No flame - no claim to a good burger. Period. I actualy love the Koppe fries with the skins on them. There is no good hamburger in BCS only some that are not so bad. Howdy, Chicken Oil and Dixie Chicken are owned by the same people and make just about the same burger...Koppe Bridge is good, but I prefer Chicken Oil over all 3! Its hands down an amazing burger! As a former employee of Chicken Oil, I really must point out it is the "Snuffy Special," not "Snuffer"
For a better value at Chicken Oil Co, you want to hit it up on a Monday. Half priced burgers! Koppe Bridge is good, and also try Juneks BBQ and Grill down in Wellborn (on Wellborn) delish. just found your blog and love it. As an Aggie, I have fond memories of COC. I seem to remember some Tijuana Cheese Fries which were served with ranch that made a great side to the burger. That and a pitcher of Shiner. Maybe its time for a road-trip. It makes me incredibly sad that someone would imply that a Koppe Bridge burger is good, let alone better than Chicken Oil. I am crying inside. Dixie Chicken and Chicken Oil ARE the same thing btw. I'm a Bryan native. Chicken Oil Co. and Dixie Chicken used to have the same owner and both are pretty much the same. The fries are not the best, but with cheddar cheese and ranch dressing smothered all over them, it's a different story. These are Tijuana Fries and I highly suggest them with your burger. It only adds to the clogging of the arteries, but you didn't come here to have diet food in the first place, so go for it! I attended A&M fall'85-fall'87. I never went anywhere other than the northgate strip, since my truck was parked way over across the tracks and B/CS traffic was horrible. I mostly ate at the on campus chow halls since it was paid for. I did eat at the cow hop some. I spent plenty of time in the Dixie Chicken, but only consumed liquids there. I remember cow hop burgers being good and a decent deal but I don't remember more details, likely because I would then go to the Chicken. Double Dave's had good pizza and pizza rolls and a really great beer selection, before that sort of thing was common. My first roomate in college turned me on to the good beers. If you are ever in Huntsville try Mr. Hamburger (50's drivein without carhops) , the Cafe Texan, or Zach's. Recently dined at Chicken Oil sober, big mistake, one of the worst burgers I've ever had. The burger consisted of a cold charred dry patty with a couple slices of unmelted kraft cheese on top. It looked nothing like the one in your pictures. Maybe they are under new management. One of the best burger I've had is in Joe's Hamburgers, about 15 miles north of BCS. LIVED THERE ALL YOUR LIFE??? And NEVER went to Chicken Oil Co.? Wow!! I left Bryan, Texas in 1992 to move to Tennessee and the Chicken Oil Co. (and Brazos Blue Ribbon Bakery Kolaches) was(were) the thing(s) missed most by my wife, 5 children and ME..... Greatest cheese burger, fries, cold beer, atmosphere. The people working there were great, although I'm sure many have come and gone since then. But apparently the food is still GREAT!!!! We went to DSP on Sunday nights live music! & Great Burgers! Always wondered who was playing music there then. Lyle...???? Robert Earl...??? That would have been about the time they were there, I think. Great memories! Chicken Oil Company's specials run from 5 to 9 PM. We offer half price burgers on Monday nights and kid's eat free from the children's menu with an adult purchase. Yes Lyle and Robert Earl Keen Jr. both played at Dead Solid Perfect. My uncle owned the place and I used to work there to pay off my pinball machine tab. He still lives in Bryan but he's not in the food business anymore. I always thought if I open a place of my own ever, I will have the 2/3 pound DSP. Chips, no fries. Truly miss the Cow Hop. Anyone know if the owner, Al Scazerro, ever opened another restuarant? I'd definitely try it out. I also liked Danvers - you could pile it on! To this day, I still believe DSP had the best burgers anywhere! Sure do miss it! So glad to finally find out what happened to DSP...still the best burgers ANYWHERE---and affordable by a poor college student!